Spits and farts are little pilots with no internal measurement framework. And then these companies are confused as to why they can’t get traction internally. Well, you haven’t created a business case with empirical evidence that you can submit to a senior executive who, frankly, doesn't care about the actions or the activities that yield results. The people that fund businesses, myself as a CEO, are always thinking of these business outcomes. I’m less concerned with the actual activities that yield business outcomes than the outcomes themselves. If social selling happens to be a performing activity that gets me to a result, great. But as an executive, I don’t really care how I make the money, as long as it’s made. I think that sometimes is lost on customers, senior managers, and directors, and even regional vice-presidents. They don’t realize that unless you build a business case that shows how certain activities yielded sales objectives, goals we all set out to do, and those objectives led to a business result we all agree are positive, the initiative is a lost cause. Social activity leads to sales objectives, and sales objectives lead to business outcomes. If you reverse-engineer your goals, it becomes much easier to fund projects. Because the people who fund these projects can see a linear progression of where the money is going. I give a dollar, I make five back. So in that context, the first awakening has to be to create a measurable business plan. This business plan has to show us empirically that what we did could turn itself into an outcome that the company wants. And that doesn’t always mean revenue— that could mean market share, that could mean increased inbound lead flow, whatever your primary business objectives are, your business plan has to end up there. To first think about what we’re going to measure, we have to think about how we’re going to measure it. One of the biggest challenges companies face is when they corner enablement, marketing, or sales, and ask what they want. They might say, “We want 20% uplift in net new leads or sales.” Well, that’s great, but you can't really control that. You can only influence it. It would be like saying, I want to be a size four model. That sounds amazing. But do you know how you're going to get there? I can say I want to weigh 175 pounds and have 10% body fat, but I can't directly control that. I can only influence it. What I can control is my caloric intake and caloric burn, which directly affect my weight. The same works in sales; it’s cause-and-effect management, the same way that weight loss works. If Social Activity is your cause, then sales objectives are your effects! 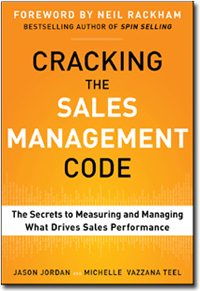 According to Cracking the Sales Management Code, “Activities will influence up to 80% of your results.” What this means is that your team’s social activities directly translate to sales objectives met or fallen short. You have to understand that it’s direct activities that are going to influence where we want to go. And where we want to go to influences the type of sale objectives and business outcomes that we all want. You can highly influence sales objectives obtained or not obtained. By sitting down and reverse-engineering your objectives as a business, scaling them back to the sales objectives (new logos, increased market share, shortened sales cycles, etc. ), and finally, to the daily actions and activity, you can bulletproof your social selling program and ensure it is successful. At New Horizons, they knew they wanted higher sales. They figured out the best way to do this (their sales outcome) was to 10X their database. Why? Because by 10x’ing the database, it gave them a higher probability of selling their IT training services. Once they nailed down the business and sales objective, they were tasked with examining the activities and actions that would lead there. What they ended up doing was creating a blitz time from 4 to 5pm every single day where the sales professionals needed to add ten net new contacts from LinkedIn into their CRM. Net new contacts from social is activity they could control, which led to influence, which is a sales objective of 10x’ing the database, which by 10x’ing the database over periods of time, that leads to a business outcome, which would be greater leads. So you can see how it all comes together in the long run. Activities and these sales objectives are an effect that you can move towards a business outcome. There's no sense in even starting a ‘spits and farts’ project unless you create empirical evidence about it. Why? The answer is simple: Because you can’t scale it. When you want to make a program bulletproof, you have to sit down and write your goals. What do you need as a business? You cannot control business outcomes, but you can align towards them. Next, what are your sales objectives that you can influence? What are the core selling levers you can pull? Finally, what are the activities that will control those sales outcomes. Write these down, communicate to your sales team. Say, come hell or high water, we’re going to do these activities day in and day out, week by week, and by getting there, we’re going to align ourselves to the goals that we all need.